I also spent some time with an area SEEDS coordinator planning opportunities for working with K-12 students, both here on the farm and in the classroom. I had a blast when the 4th graders came out this spring to see how we do things on this “old fashioned farm,” as one of them put it, and I’m kinda geeked to be brainstorming other educational activities for the future. Speaking of the future, overnight lows in the 50s are slowing down garden growth. Vines are just beginning to look a bit tired around the edges. It’s only noticeable if you really look, but amidst all of this lush bounty, I can feel the garden begin to whisper the beginnings of a quiet sigh. 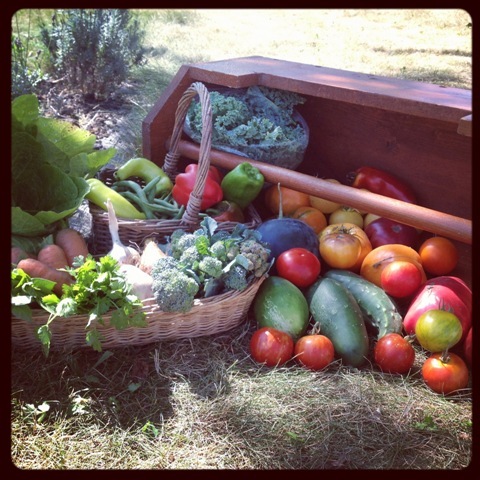 We are definitely approaching the tail end of the summer season, with another 3-5 weeks remaining to enjoy the bounty. This week I said good bye to my dutiful harvest day helper, Casey Aldrich, who did a bang-up job keeping all of us in line and productive this summer. 🙂 Thanks, Casey! Have a great school year. Heirloom Tomato Salad: http://www.101cookbooks.com/archives/heirloom-tomato-salad-recipe.htmlOh, Heidi, you create such beautifully simplistic, lush dishes. SWAPS: There is a spot on the farmstand fridge labeled swaps where you can trade something in your basket with someone else. Leave something — take something! This entry was posted in CSA Share, Recipes and tagged beans, brocolli, carrots, cucumbers, eggplant, garlic, kale, peppers, tomatoes. Bookmark the permalink.